For our copper sensor we used the native operator of copper homeostasis from E.coli K12. This includes the promoter copAP and its regulator CueR. CueR is a MerR like regulator, which stimulates the transcription of copA, a P-type ATPase pump (Outten et al. 2000). CopA is the central component in obtaining copper homeostasis, it exports free copper from cytoplasm to the periplasm. This is enable by Copper induced activation of the operon transcription via CueR. The CueR-Cu+ is the DNA-binding transcriptional dual regulator which activates transcription(Yamamoto, Ishihama 2005) To sum it up CueR regulon plays an important role in aerobic copper tolerance in E.coli (Grass, Rensing 2001).In BBa_K1758324 we combined the codon optimized CueR (BBa_K1758320) under the control of a constitutive promoter with strong RBS(BBa_K608002)with copAP and sfGFP (BBa_K1758321) for measuring output signals. Through the addition of a 5’UTR before the sfGFP we optimized the expression of sfGFP and increased. This part is essential for our in vitro characterization of our copper sensor. The edition of T7 promoter to BBa_K1758323 enables us to characterize tihs sensor in our CFPS. Our sensor for copper detection consists of CueR a MerR like activator and the copper specific promoter copAP. The promoter is regulated by CueR, which binds Cu 2+-ions. We also used a sfGFP downstream the promoter for detection through a fluorescence signal. For our copper sensor we used the native operator of cooper homeostasis from E.coli K12. We constructed a part(BBa_K1758324) using the basic genetic structur showed in Our biosensors.The operator sequence, which includes the promoter (copAP), is regulated by the activator CueR. 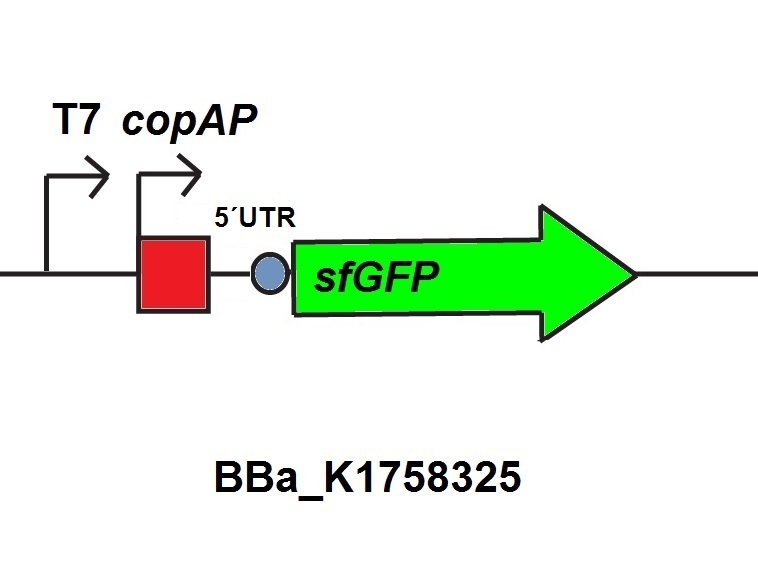 In BBa_K1758324 we combined a codon optimized version of cueR (BBa_K1758320) under the control of a constitutive promoter with sfGFP under the control of the corresponding promoter copAP (BBa_K1758321)(figure 1). Through the addition of a 5’UTR before the sfGFP we optimized the expression of sfGFP and increased fluorescence. In vivo we could show that the adding different concentrations of copper has effects on the transcription levels of sfGFP. 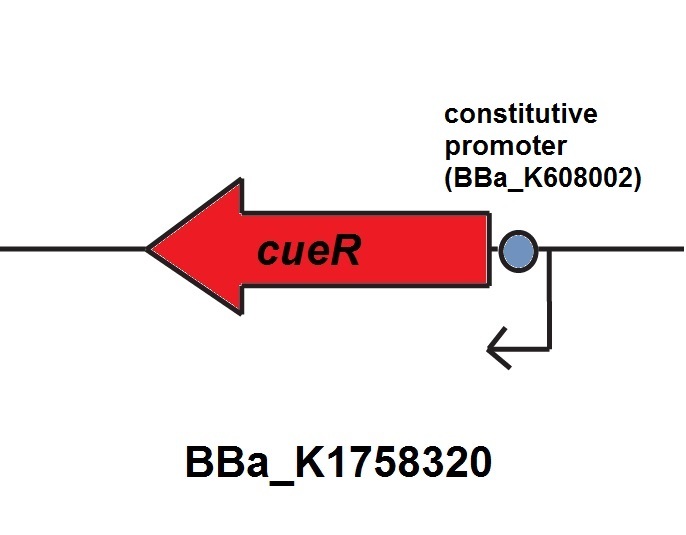 Figure 1: The concept of our in vivo copper sensor (BBa_K1758324), which consists of the activator under the control of a constitutive promoter (BBa_K1758320) and the operator and promoter sequence of the copper inducible promoter. An untranslated region in front of the sfGFP, which is used for detection, enhances its expression (BBa_K1758323). 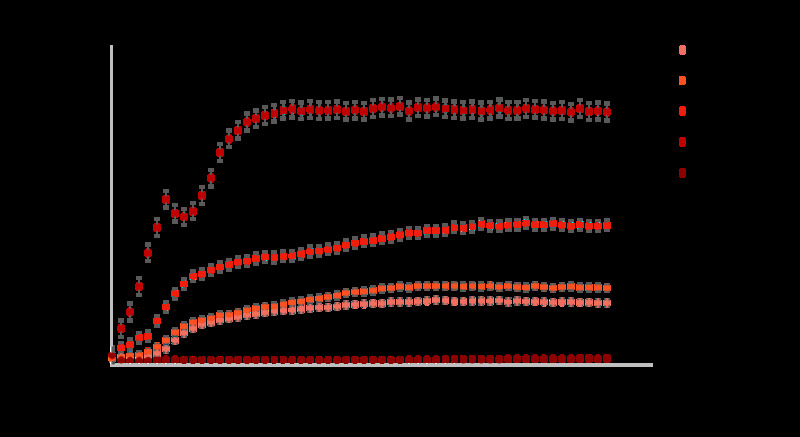 Figure 2: Time course of the induction of a copper biosensor with sfGFP for different copper concentrations in vivo. The data are measured with BioLector and normalized on OD600. 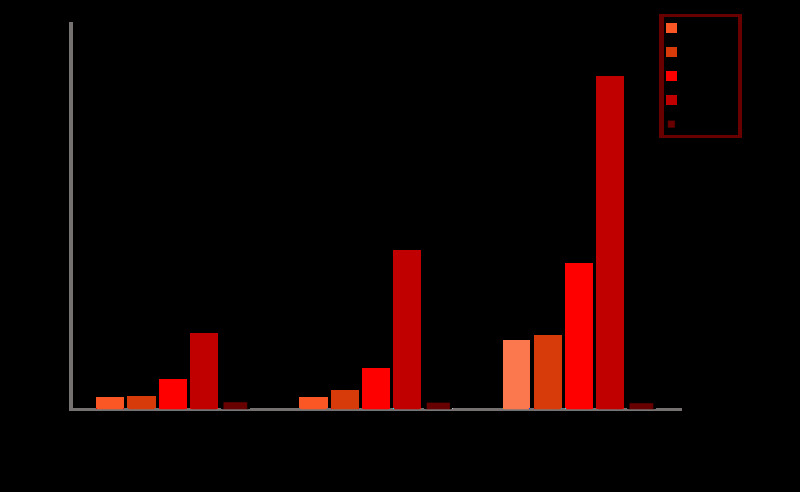 Error bars represent the standard deviation of two biological replicates. Figure 3: Fluorescence levels at three different stages of cultivation. Shown are levels after 60 minutes, 150 minutes and 650 minutes. We tested our in vivo ccopper sensor with sfGFP as reporter gene, to test the functionality of the system. Moreover we tested different copper concentrations. The kinetic of our sensors response to different copper concentrations is shown in figure 2. The first 10 hours show a strong increase in fluorescence. After that the increase in fluorescence is slower. For better visualization the kinetics of figure 2 are represented as bars in figure 3. A fluorescence level difference for 60 min, 150 min and 650 min is represented. The shown data suggest that sensing copper with our device is possible even if the detectable concentrations are higher than the desireble sensitivity limits. Therfore we tested the copper sensor in our in vitro transcription translation approach. For the characterization of the copper sensor with CFPS we used parts differing from that we used in vivo characterization. For the in vitro characterization we used a cell extract out of cells which contain the plasmid (BBa_K1758320) (figure 4), so that the resulting extract is enriched with the activator CueR. To this extract we added plasmid-DNA of the copper specific promoter copAP with 5’-UTR-sfGFP under the control of T7-promoter (BBa_K1758325) to the cell extract. The T7-promoter is needed to get a better fluorescence expression. Figure 4: To produce the cell extract for in vitro characterization a construct (BBa_K1758320) with copper activator under the control of a constitutive promoter and strong RBS (BBa_K608002) is needed. 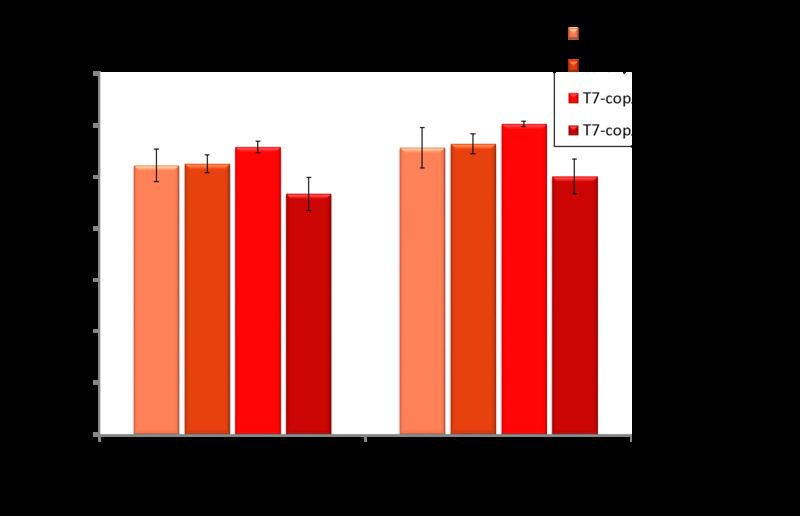 Figure 5: T7-copAP-UTR-sfGFP BBa_K1758325 used for in vitro characterization. The results presented in figure 6 illustrate the influences of different copper concentrations on the cell extract. Figure 6: Influence of different copper concentrations on our crude cell extract. Error bars represent the standard deviation of three biological replicates. 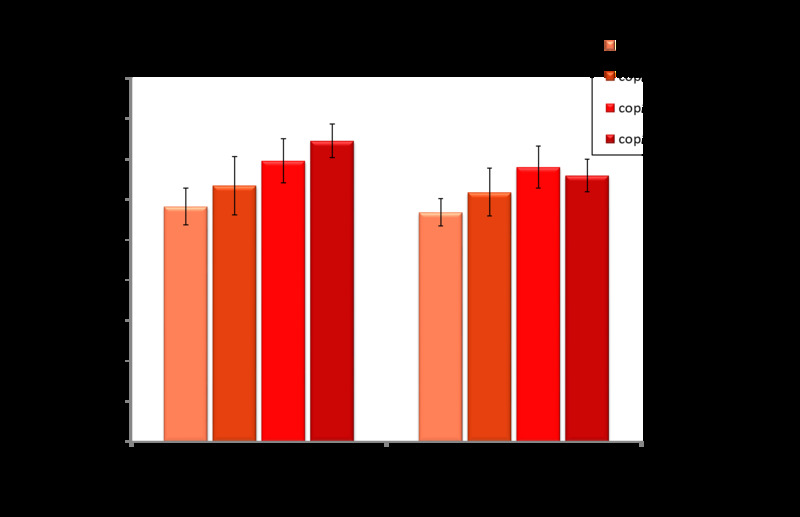 As shown in figure 6 copper has no negative influence on the functionality of our cell extract. Therefore, a relatively stable system for copper sensing is provided. First tests with specific cell extract and different copper concentrations lead to further tests and normalizations, illustrated in figure 7. Figure 7: Copper specific cell extract made from E. coli cells which have already expressed the activator before cell extract production. 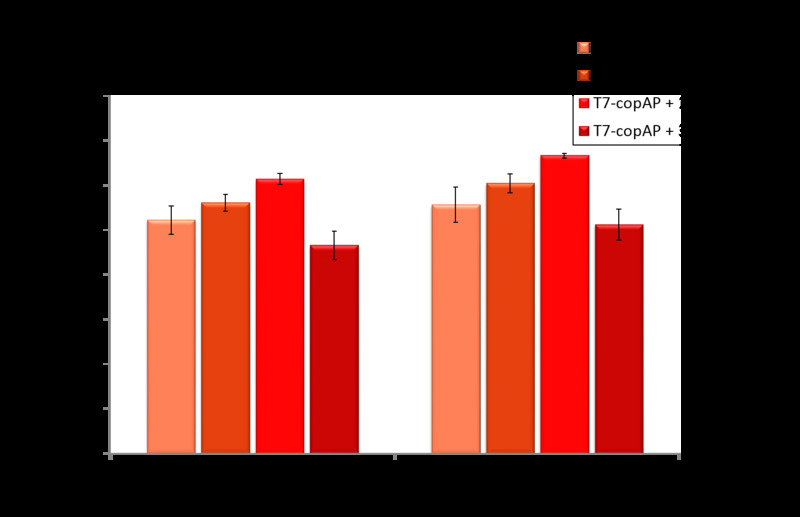 Induction of copper inducible promoter without T7 upstream of the operator site with different copper concentrations. Error bars represent the standard deviation of three biological replicates. Figure 8: Copper specific cell extract made from E. coli cells which have already expressed the activator before cell extract production. Induction of copper inducible promoter without T7 in front of the operator site with different copper concentrations. Error bars represent the standard deviation of three biological replicates. Data are normalized on coppers influence to the cell extract. In addition,we measured the operator device under the control of T7 promoter as described before. Fluorescence was normalized to influence of copper on the the cell extract (figure 9 and figure 10). Figure 9: Copper specific cell extract made from E. coli cells which have already expressed the activator before cell extract production. Induction with different copper concentrations. Error bars represent the standard deviation of three biological replicates. Figure 10: Copper specific cell extract made from E. coli cells which have already expressed the activator before cell extract production. Induction of copper inducible promoter with different copper concentrations. 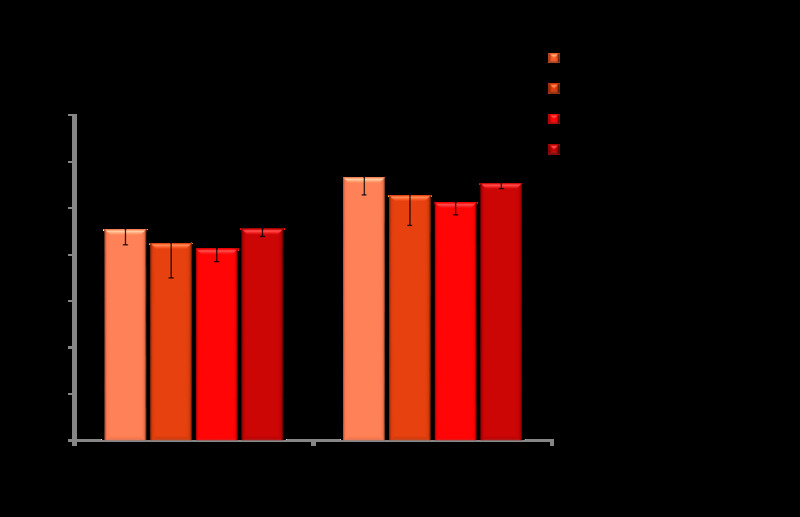 Error bars represent the standard deviation of three biological replicates. Data are normalized on coppers influence to the cell extract. Compared to the former fluorescence levels the T7 reporter device showed higher levels. Therefore, a reporter device under the control of T7 promoter is more suitable for our CFPS. After normalizing on coppers influence to the cell extract these differences were even more obvious. Grass, Gregor; Rensing, Christopher (2001): Genes Involved in Copper Homeostasis in Escherichia coli, checked on 8/26/2015. Guidelines for Drinking-water Quality, Fourth Edition, checked on 9/9/2015. Outten, F. W.; Outten, C. E.; Hale, J.; O'Halloran, T. V. (2000): Transcriptional activation of an Escherichia coli copper efflux regulon by the chromosomal MerR homologue, cueR. In The Journal of biological chemistry 275 (40), pp. 31024–31029. DOI: 10.1074/jbc.M006508200. Yamamoto, Kaneyoshi; Ishihama, Akira (2005): Transcriptional response of Escherichia coli to external copper. In Molecular microbiology 56 (1), pp. 215–227. DOI: 10.1111/j.1365-2958.2005.04532.x.